Maintaining a constant trans-membrane pressure (TMP) is critical because if it is too high it can cause gel-layer formation that cannot be removed by recirculation. 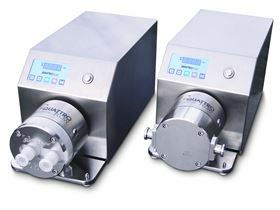 Quattroflow offers a full line of quaternary diaphragm pumps ideal for incorporation into Tangential Flow Filtration (TFF) systems used to concentrate and diafiltrate target protein solutions during the ‘downstream’ purification stage of biopharmaceutical production. Also known as cross-flow filtration (CF), in TFF the feed stream flows tangentially across the filter membrane at positive pressure. As it passes across the membrane, the portion of the feed stream that is smaller than the membrane’s pore size passes through the membrane (called permeate). This is different than other filtration techniques because the tangential motion of the fluid across the membrane prevents molecules from building up a compact gel layer on the surface of the membrane. This mode of operation means that a TFF process can operate with relatively high protein concentrations with less fouling or binding of the filter.